After over a year-long hiatus, I'm back, and one of my resolutions this year is to spend more time with this blog. 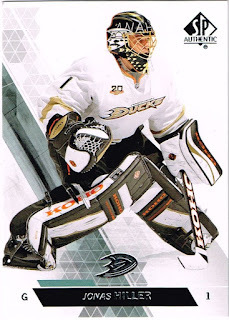 Hiller, mostly known for his classic all-black mask, changed it up for a short time between 2012 and 2015, and it was a change for the better. The iconic black is just pushed to the next level with this minimalist design, featuring the Ducks logo and Anaheim skylines. Not a lot needs to be said about this one. I've mentioned its fame, and, it must be said, it looks dang good. 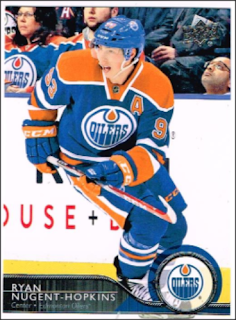 Paul Kariya signed his first NHL contract with the Anaheim Ducks, Kariya had been Anaheim's first draft choice (fourth overall) when they entered the NHL in 1993. Paul Kariya's first NHL contract was a three-year, $6.5 million deal. He impressed so much during those three years (Calder nominee, NHL All-Rookie team, 50 goals, 100 points in second season, youngest active captain at the time, back to back All-Star, Hart runner-up, back to back Lady Byng wins) that the Ducks would resign him in 1997.... and again in 1999 and 2002. 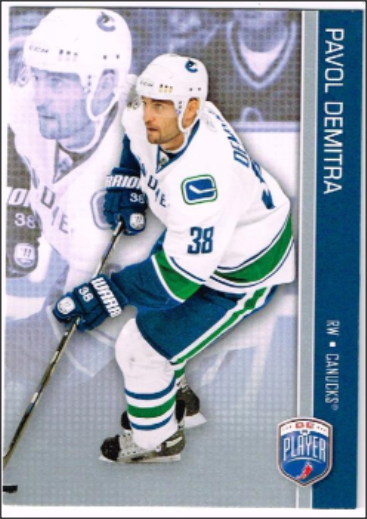 He finished his career with 402 G, 587 A, and 989 points in exactly 989 games after stints in Colorado, Nashville, and St. Louis. 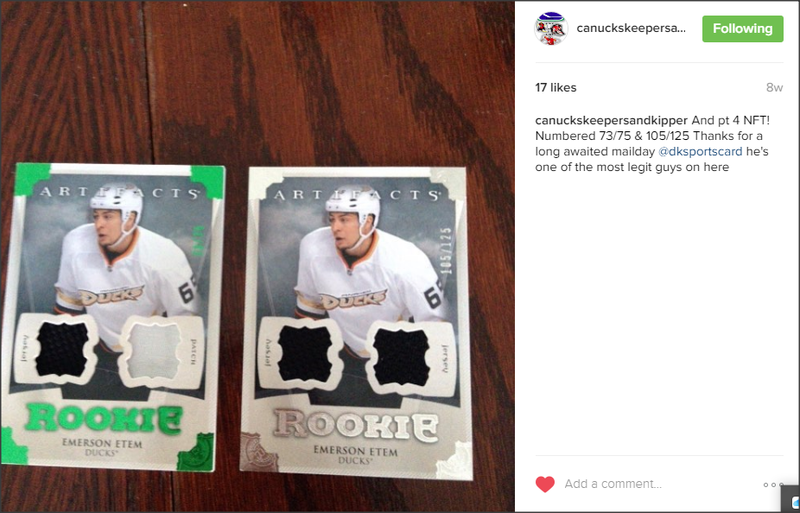 So as requested by my Instagram friend and fellow British Columbian, micerule934, I have comprised a list of the five worst base sets of this millennium. I rated these critiquing photography, card design, and back info. 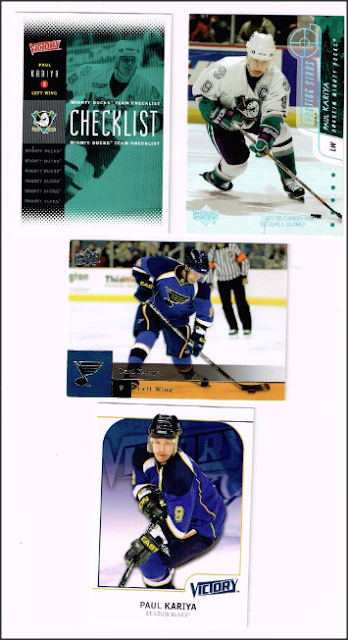 I only chose sets that I had cards of in my collection, so unfortunately, I could not include this year's Full Force. 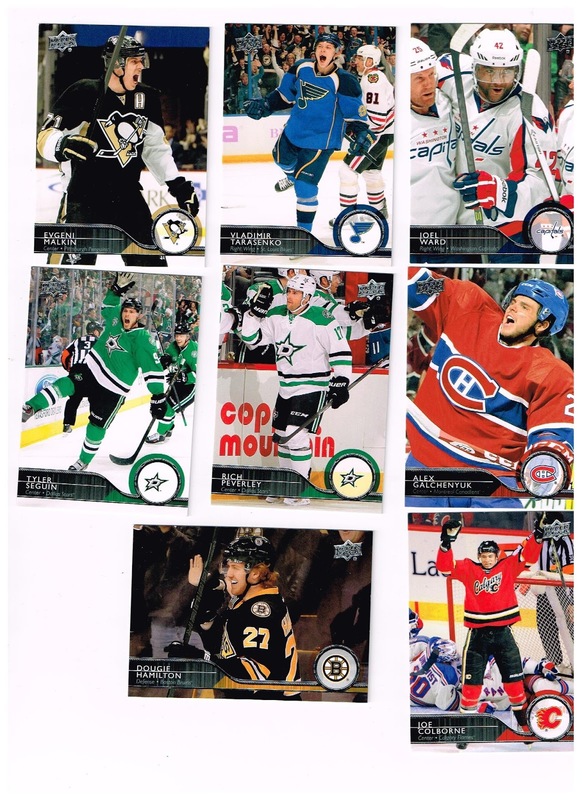 So for my reviews, I've chosen one card from each set that I can analyze and point out common things that I find wrong with the majority of the set. Without further adieu, I present to you, the worst base sets of the 21st century. 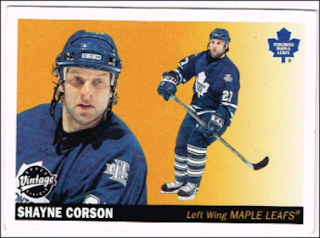 Right off the bat, we can see that the background removal tool was used impeccably with these photos of Shayne Corson. I really don't see the purpose of using two photos at all actually, and because neither of these are action shots, as are many in this set. 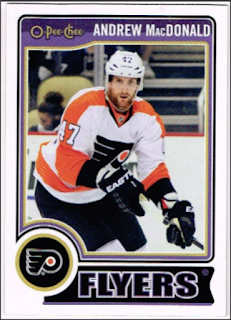 I've never liked up close photos on cards, unless they're actually meant to be posing, because it is generally unflattering. 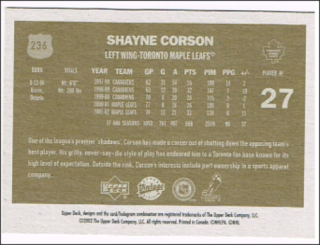 Another problem I have with these cards is that there is a white border, fine, but there's also an internal black border, which makes the card seem small. Let's start off with design. 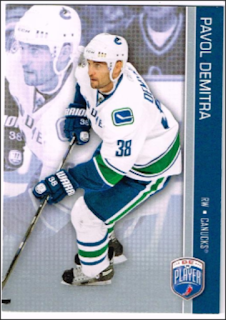 It looks like a cheap promotional giveaway that the Canucks, at least, would do for Jeans Day. 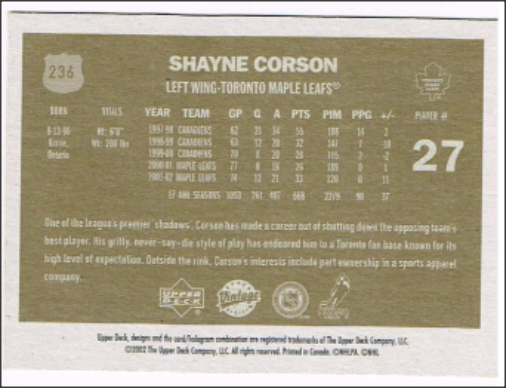 Obviously, there is no mention of jeans on the card, but the overly simple border and font make one believe that it is a wannabe Upper Deck brand card. I mean, even the logo is somewhat out of place, because it looks like a charity brand. Behind the nicely cropped main photo is.. the same photo. Except it's not cropped so one can see the very reason that the main photo was cropped in the first place... the boring background featuring bored fans. Likely they are bored because almost none of the pictures in this set are action shots. On the back, the simple design is kept up, although with a bit more colour, which is nice. However, the card only features five lines of stats which is common, but what about all that space above? 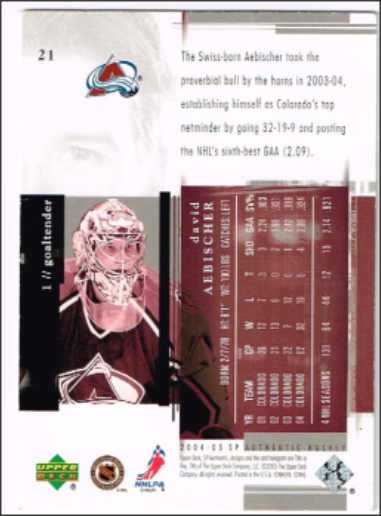 I mean, they literally just filled it with the EXACT same picture from the front, which means that the picture was featured THREE times on this card! It's also zoomed in to fit in the massive amount of space they have, which makes it a little blurry. The colours. Sometimes they actually match the team, but mostly, there is absolutely no reason why the colour is featured. "Hey, Andrew MacDonald plays for the Flyers, so let's make the colour of the border purple!" 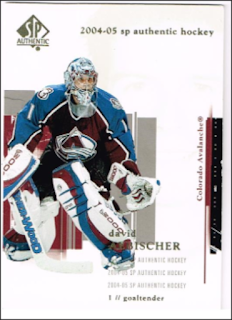 Also, like UD Vintage, there's an additional white border on the outside. Also, none of the pictures in this set are action shots. The fan in the background here is justifiably bored. 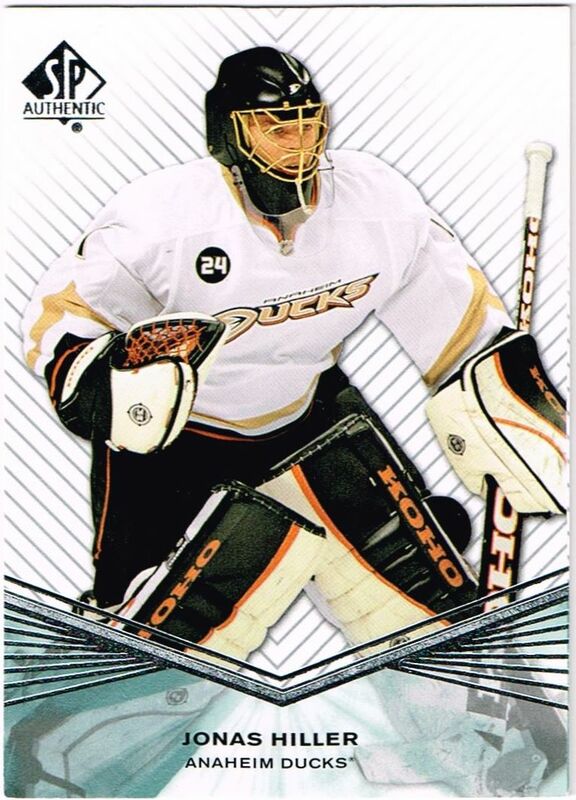 It also doesn't help that all of the cards have the team name on the front... 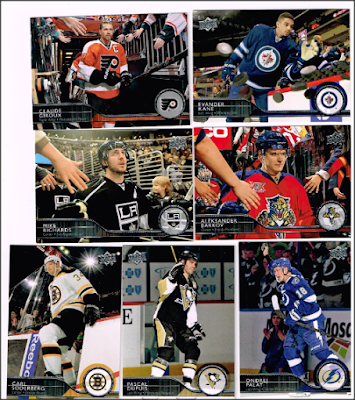 Except Nashville, Winnipeg, and Colorado, because...reasons? Which also brings to mind the fact that the team names change sizes to fit in the bottom, which isn't a big deal, but may annoy some. On the back, it's not certain whether Upper Deck is trying to recapture the old charm of O-Pee-Chee or give it a modern identity. 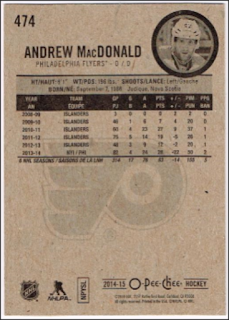 The plain cardboard background is there (which makes it somewhat difficult to read the stats) but where is the player blurb that was so interesting on old OPC? Also, the back picture is tiny. There it is. Just a face in the background. It's not just David Aebischer, by the way, this does happen with all of the other cards. On the back, we can see that perhaps Google Gravity may have been used in the design. 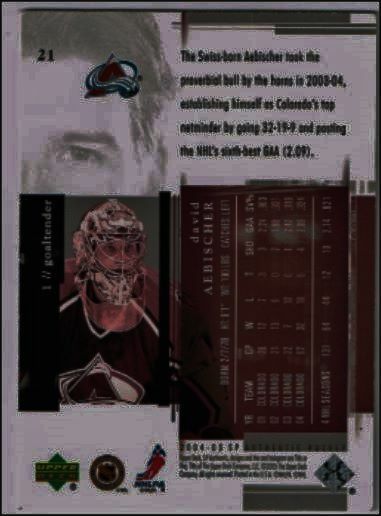 The stats are sideways, the player blurb is upright, and oh dear, there's the face again, in the top left, although this time Upper Deck just decided to include the one eye. 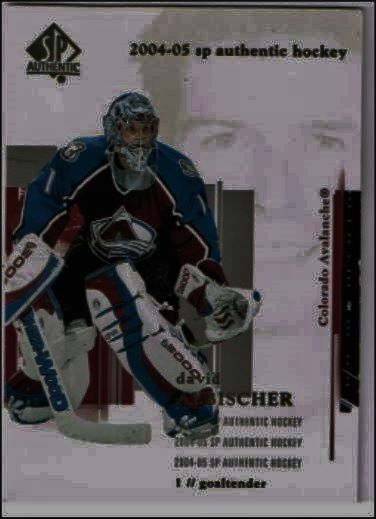 Now that is creepy. But mostly, it's just players skating around. I feel you bro, I feel you. 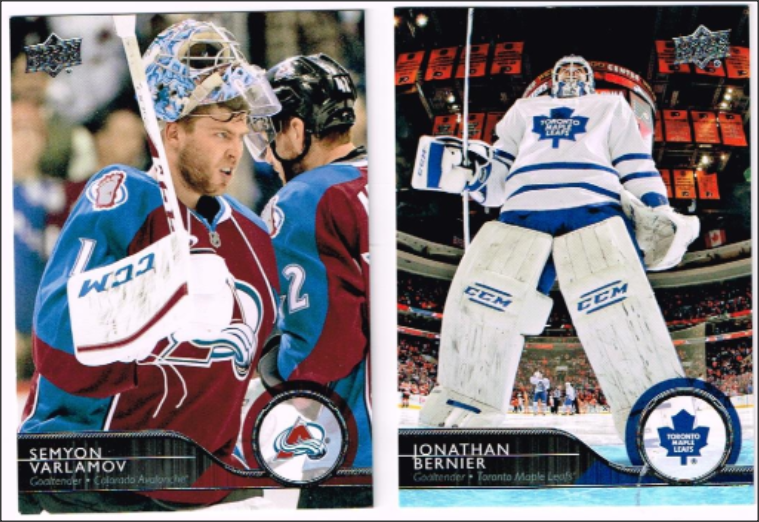 I mean, they even managed to get the goalies just skating around! Now the back design is actually quite nice... however in the blurbs we get lovely reminders of (left to right) days way WAY gone by, insignificant games, how Colorado brutally choked in the '14 playoffs, and how Jiri Hudler was shamefully snubbed off of the 2014 Czech Olympic roster. So those are my thoughts on the worst sets of the 21st century, what are yours? Tell me in the comments! Thanks for reading, and follow to keep updated for more hockey card posts! Apologies for my lack of posts, I have been quite focused on the Instagram card community as of late, and if you are following me there, you'll know that I have gained quite a few nice cards! 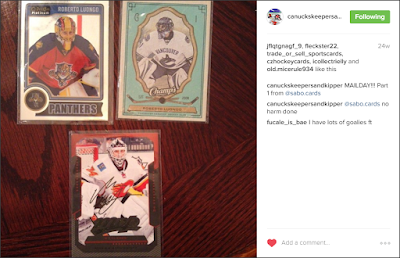 The Instagram folks have been great to me, I have made 12 total trades at last count and I have 2 trades coming in. I've had some late packages yes, but I'm not going to get super mad because let's be honest here it's hockey cards, and the only late packages I have so far are base cards and free giveaways. 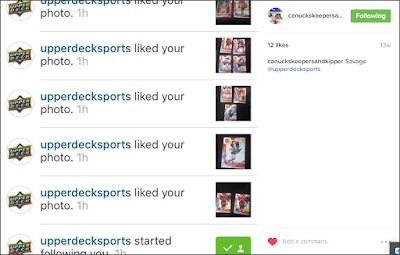 It wasn't big but I thank @sabo_cards for a nice little trade to get my Insta career started! So, yeah. I was pretty excited to get this sweet steal off of eBay. Beckett value: $20. My price: $4.50! 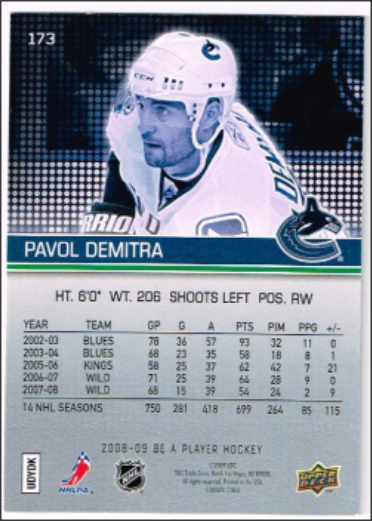 The most I've ever spent on a card, $17.50 CAD, however I got a sweet steal here too, as BV is $40! 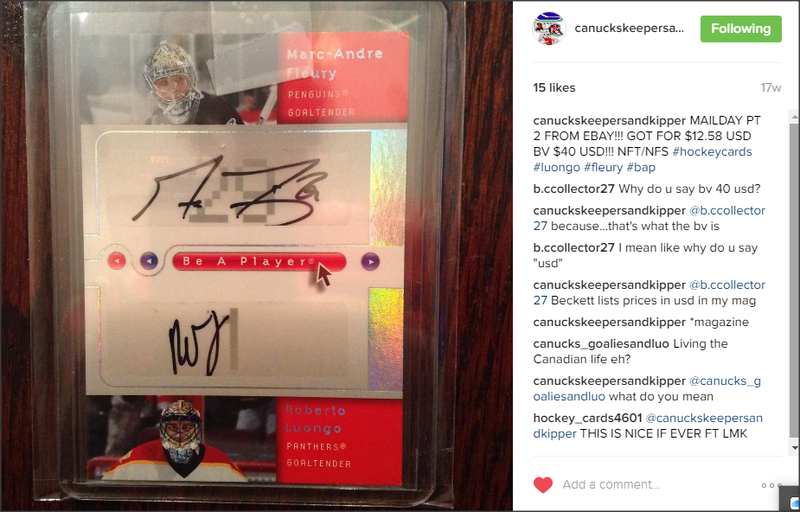 It's my first Luongo auto, and Fleury is a bonus haha. 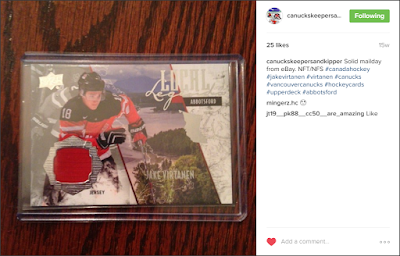 So Jake Virtanen is on the Canucks, so obviously I like him. 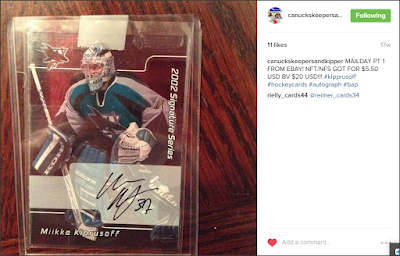 He's also from my hometown, which made me want to get this Local jersey of Virtanen. It features both my town and my player. 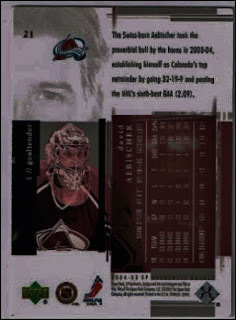 This is where I got my first McDavid. And my second one. I spent a lot of money that day. 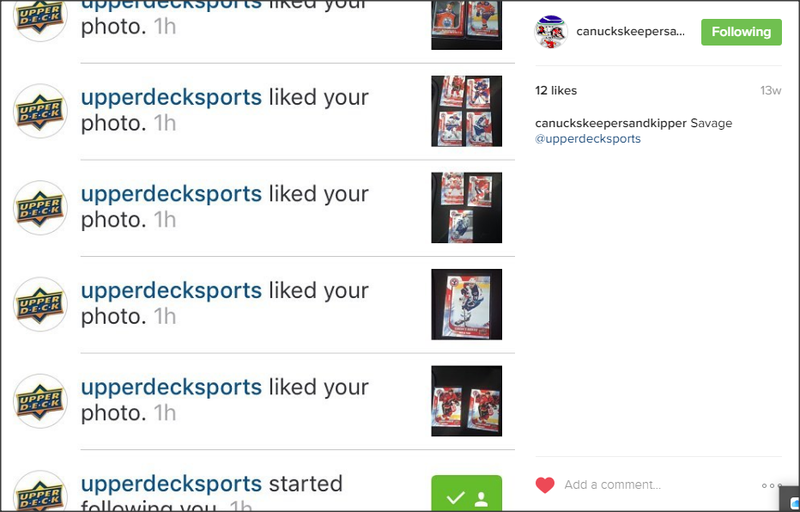 @upperdecksports finally followed me on Instagram, and they spammed my page with likes too! 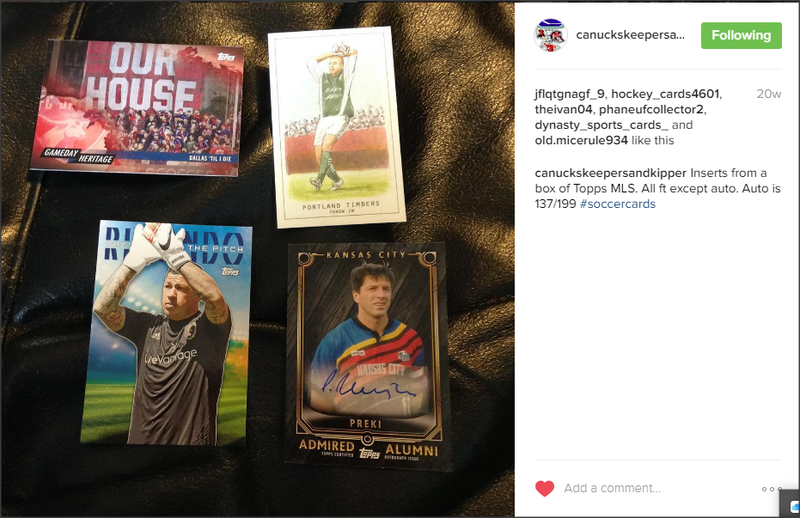 I went to a card show in Burnaby and it was great! 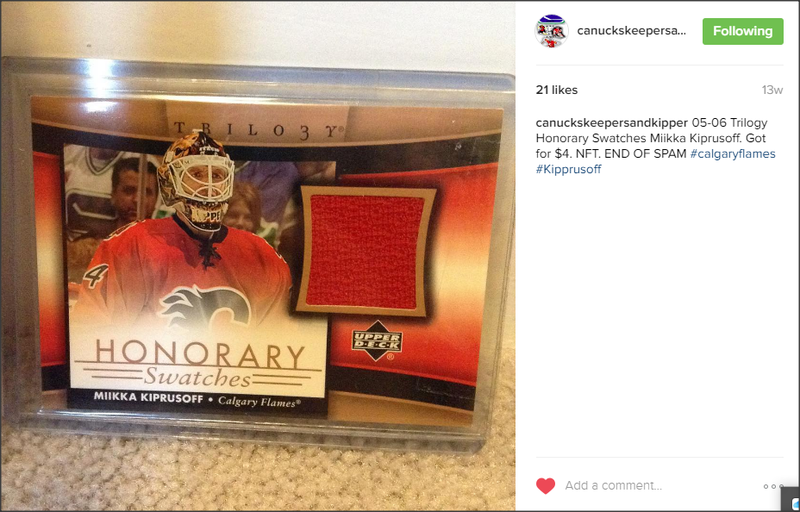 Got lots of Kipper! 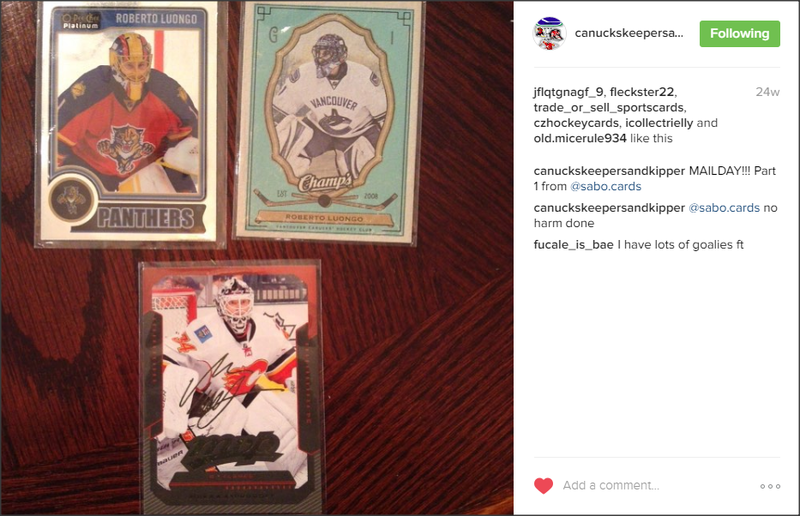 CBC came to Abby and my friends and I got some stuff signed by Kirk McLean himself! 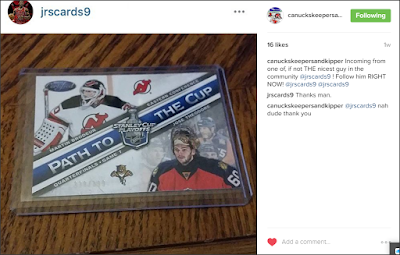 @dksportscard, one of the nicest people I have encountered so far in the community, held a giveaway for followers, and I was lucky enough to win it! Of course, it had to take around four months to get to me because life. 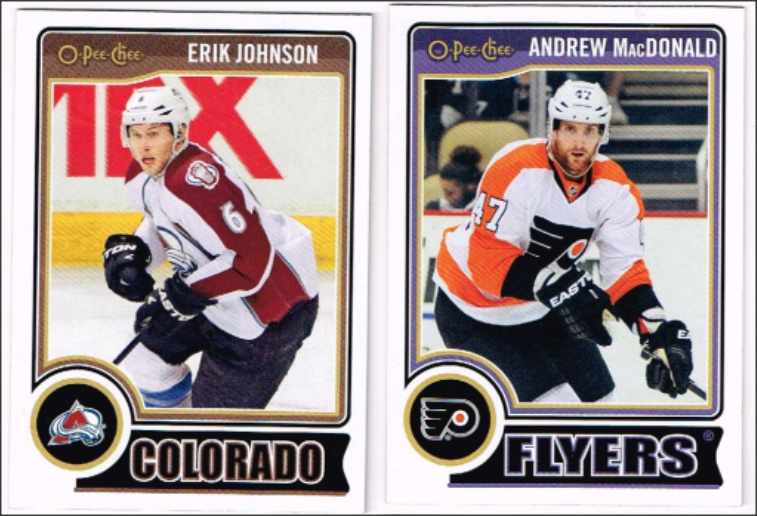 However I got lots of great cards, including those two Etems above. 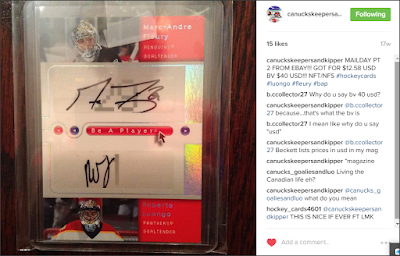 My biggest trade, value & card number wise with @mingerz.hc, and I lost a McDavid rookie and Panarin rookie materials. RIP. So I was very interested in this particular card, and I DM'd the guy and asked if he liked any of my cards. He said no... but he'd give me the card for free. @jrscards9 is one of the reasons I love this community. So thanks all for keeping up with my posts (or lack thereof). Keep updated for more! 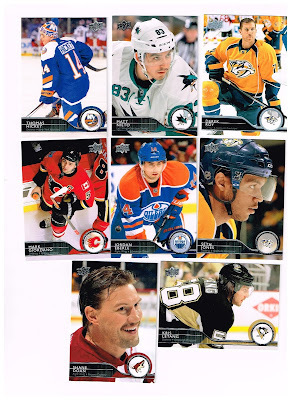 I recently posted a review on Hockey Card Stories on my book reading blog, Micah Reads Books, and it'd be great if you could check it out, and maybe follow that blog as well! Check out the post here. Thanks for reading, and keep updated for more hockey card posts! 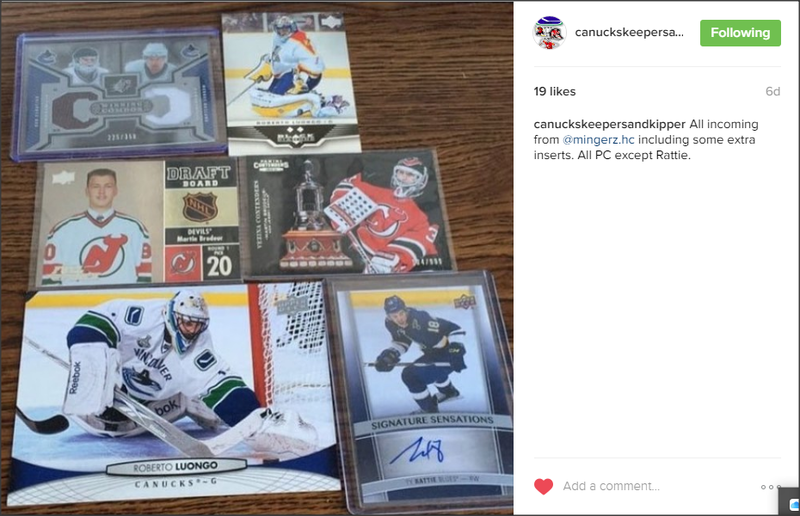 Hey everyone, I have decided to join the hockey card collecting community on Instagram, and I'll be looking to sell and trade some of my cards. It is called canuckskeepersandkipper and feel free to check it out! Thanks for reading and keep updated for more hockey card posts! 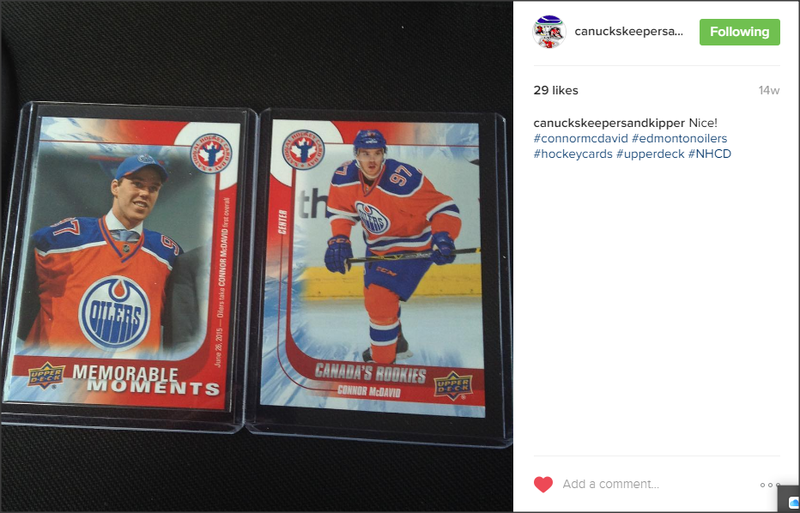 So Tim Horton's is selling hockey cards now. 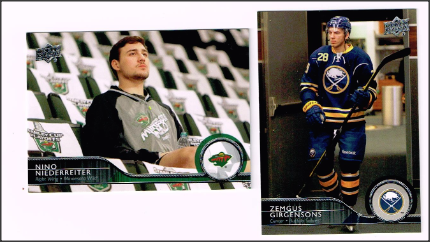 A decent price, 2 bucks for 1 pack of 3 cards, however the insert to base ratio is excellent, as I have gotten an insert in each of the three packs I've gotten. 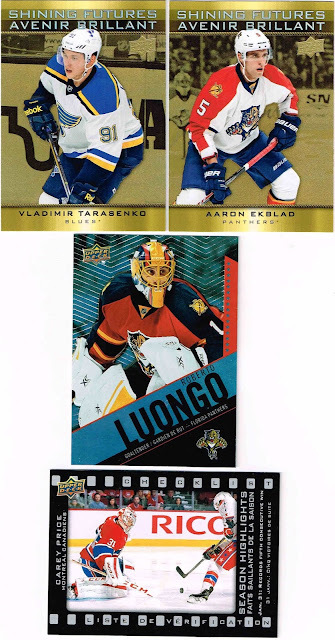 I've gotten 2 Shining Futures and one Season Highlight, all of players who had great seasons last year, plus a Roberto Luongo base card, my first of him as a new Panther.